This Bighorn Ram looks ever alert as it stands on a rocky ledge in Waterton Lakes National Park in Alberta, Canada. This national park is a UNESCO World Heritage Site and Biosphere Reserve, so this Bighorn Ram lives in a protected area. This Bighorn Ram shows off its grand horns as it stands on the snowy rock in Waterton Lakes National Park in Alberta Canada. Waterton Lakes National Park is a UNESCO World Heritage Site & Biosphere Reserve so this ram is in a protected area and cannot be harmed or lose its habitat to development. Photo of a Bighorn sheep ram at Waterton Lakes National Park, Alberta, Canada. This Bighorn Ram seen here is a male, as these are easily distinguished by their large horns. The females have horns too but they are smaller and do not curve around to such a degree. 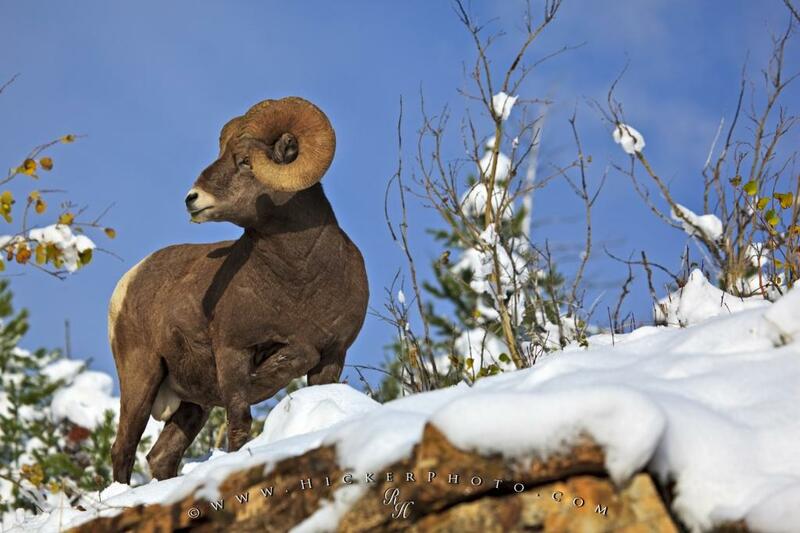 One of their most beneficial traits is the fact that they can climb and maneuver on steep and dangerous terrain, so this ram standing here is not concerned that he is on a snow covered rock as he thrives in these kinds of conditions. Bighorn sheep ram at Waterton Lakes National Park (a UNESCO World Heritage Site & Biosphere Reserve), Alberta, Canada. I photographed this photo with the digital SLR camera model Canon EOS 5D Mark II, aperture of f/6.3, exposure time of 1/1250 sec. on ISO 100, as always I used a original Canon Lens, the focus lenght for this picture was 210mm.